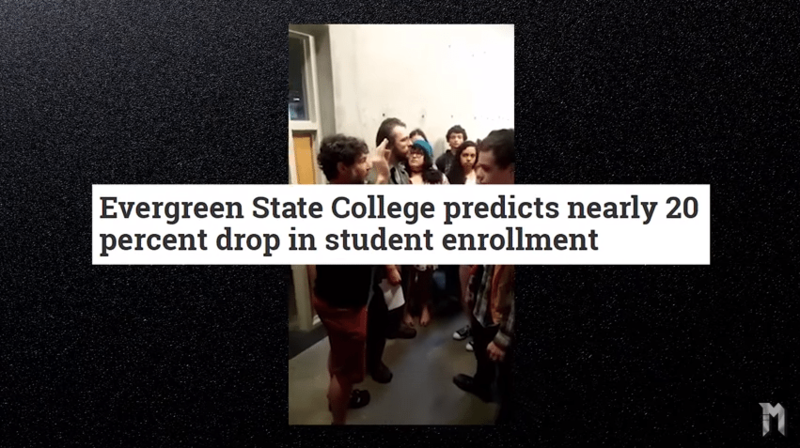 Evergreen State College, the far left institution that gained infamy last year for its “day of absence” that saw white students encouraged to leave the campus for a day, is facing a 10 percent budget cut for 2018-2019, according to the Daily Olympian. Conservative commentators jumped on the announcement, asserting that the school’s reputation for liberal extremism appears to have finally caught up with attendance. In addition to planned budget cuts, the school will also be hiking student fees, in some cases significantly. The newspaper reported that the “wellness fee” will spike to $420 a year, and the services and activities fee goes to $649 per year for full time students. The “new student” fee climbs to $275. “The announcement comes nearly a year after the college was rattled by riots following former professor Bret Weinstein’s decision to question the school’s “day of absence,” which involved asking white students to leave the grounds for a day of off-campus programming while students of color participated in on-campus workshops. “You could be forgiven for thinking that Mr. Weinstein, who identifies himself as ‘deeply progressive,’ is just the kind of teacher that students at one of the most left-wing colleges in the country would admire. Instead, he has become a victim of an increasingly widespread campaign by leftist students against anyone who dares challenge ideological orthodoxy on campus. There have been calls for Bridges to step down. Over the years, there have even been suggestions to close the college. It doesn’t appear now that the doors and windows will be shuttered, but this might be a signal that this ultra-liberal college may be forced by circumstances to bring its philosophy and reputation back toward the center.